I have a slightly complicated relationship with roleplaying games, or at least the most popular ones in the field. I know, I know, it’s a classic hipster line ‘Oh you like that? EVERYONE likes that’, but I’ve never, ever connected with Dungeons and Dragons in any of its forms, and the closest thing the industry got to a replacement, the World of Darkness games, I played and enjoyed but, again, fell off the wagon when the whole line was upgraded. I’ve heard nothing but good things about the new games, but whilst Ian Malcolm once pointed out life finds a way, he never once thought that life gets IN the way, and I’ve not hopped back on any particular game train in some while. That may change shortly. Thanks to Kickstarter I have a couple of fantastic looking new games; Farewell to Fear from the always excellent MaschineZeit and Tephra, to play with later this year. In addition, I’ve been sent Ashen Stars and Fear Itself to review by Pelgrane Press, whose entire line fascinates me, as well as Outbreak:Undead, a very unusual looking zombie apocalypse RPG, the Cubicle 7 produced The Laundry, Primeval and Doctor Who RPGs and various other systems. All in all, just as I thought I was out, I seem to be being dragged back in, especially as I have module design work on deck for at least one thing in that list (How’s THAT for being all enigmatic?). It’s a good time to be a gamer, especially one who’s actually very bored of traditional fantasy roleplaying and that brings us to Kickstarter, once again, and Ehdrigohr. I talked to him about the game, his experience as a game designer and what it’s been like using Kickstarter to bring the game to life. How did you get started in game design? I’ve been playing around with game design since I was a little boy. We were fairly destitute so I was often left to create my own toys and games from stuff that was lying around the house. I managed to keep myself and sisters fairly entertained. As I got older I eventually found my way to D&D. It was quite the struggle to get my mom to buy me a copy of the D&D Basic redbox. Eventually I got it as a rare birthday gift and I was off writing adventures and designing monsters. I discovered games that I could mod like Heretic, Doom, Duke Nuke ‘Em, Hexen, and their ilk which got me more into making video games. I got deep into video games for a while but have always had a real love for rpgs and narrative never stop tinkering with stories. What systems first attracted you? So, like I said earlier, my intro to RPG’s was D&D. I eventually gravitated to Marvel Superheroes, DC Heroes, Champion, Cyberpunk, COC and Chill. I think I was looking for games that let me play with different elements of story and tropes. I eventually found Fate and fell in love. What led to the creation of Ehdrigohr? I was a youth worker working with a bunch of great young men and women at the American Indian Health Services and the American Indian Center in Chicago. I had been using rpgs and boardgames as activities for the kids. While I could get them to play superheroes and horror stuff (they loved TMNT) I couldn’t keep them interested in anything that was fantasy. Most didn’t have any understanding of the so called “traditional” fantasy and had come from storytelling traditions that placed different values on heroes. They just didn’t want to do the “Murder Hobo’s” kind of adventure stuff. 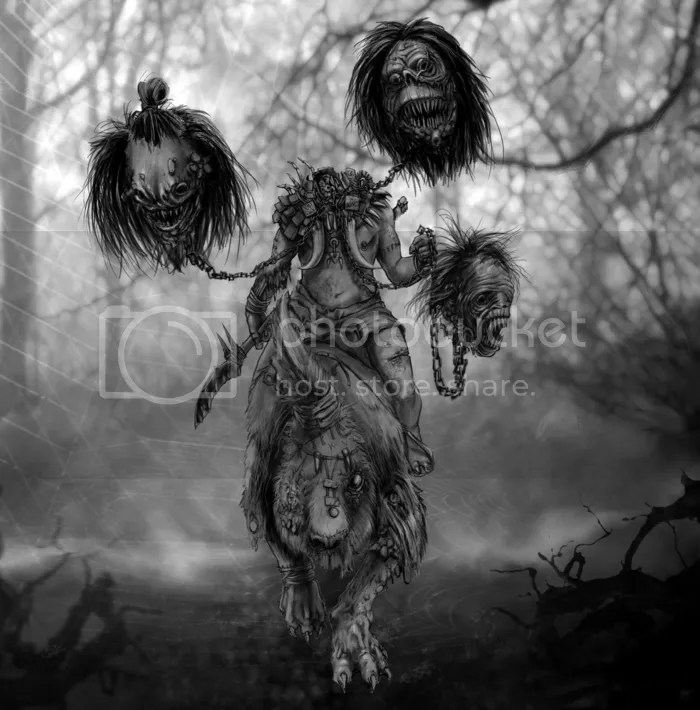 What they did love was to have me tell Native spooky stories. So, I started making a game world in the remains of an old homebrew that I had cast aside. The point was to give them a world that they could see themselves in. It had to have a lot of points of access cause I was dealing with kids who were from a wide range of heritages who had a wealth fo story ideas. Their types of stories just weren’t going to be found on the fantasy shelves of most book stores in America. So we would play bits and pieces of Ehdrigohr over the years and it bounced from system to system, getting reinvented a little bit each time. Eventually it took on a life of its own and I just listened to the stories it told me in my sleep. The response has been so great! I honestly didn’t know if people would find it too off the beaten track. I’m honoured by the good words that have come from my backers. How would you describe the game to potential new gamers? How about tribal people meets Princess Mononoke meets I Am Legend and The Black Company. The term I’ve been using is “Post-Cataclysmic, Tribal, Horror.” Lots of fantasy worlds have cataclysm stories about how the world ends. Ehdrigohr takes such an idea and tries to say what happens afterwards. I avoid post-apocalyptic because that always makes people think Mad Max and zombies. I like to think of Ehdrigohr as the mythic prehistory of another world that survived and these are the stories they tell about their ancestors struggles. What’s the part you’re proudest of? The artwork and the mythology of the world. I’ve been talking about Ehdrigohr to a lot of people over the years and they would often look at me with confusion. When I came across artists who got it and made a couple pictures that captured key ideas in the world that turned on lights for people. Suddenly there were a lot of people that got it. The important thing was for the art to convey the sense of myth and danger inherent in the stuff I’ve been writing. It’s amazing what can be conveyed in a single image. How have you found Kickstarter as a funding platform? Kickstarter has been awesome. My goal coming into it is less about the money and more about the people. I want to build a community, a tribe as it were, of people who want to share stories in Ehdrigohr. Kickstarter has been great for that. It’s an awesome way of connecting creators with their potential audiences directly. There’s a lot of stories to tell in Ehdrigohr. I want to explore various way of engaging interactive narratives, so I’ll be playing around with interactive books, comics, and apps for tablets and computers. I don’t want to dive right into video game RPGs without figuring out ways of capturing what I think is important about the story. I really dig the kind of stuff being done by folks like Quantic Dream and would love to explore the kind of storytelling they do in Heavy Rain but with Ehdrigohr. 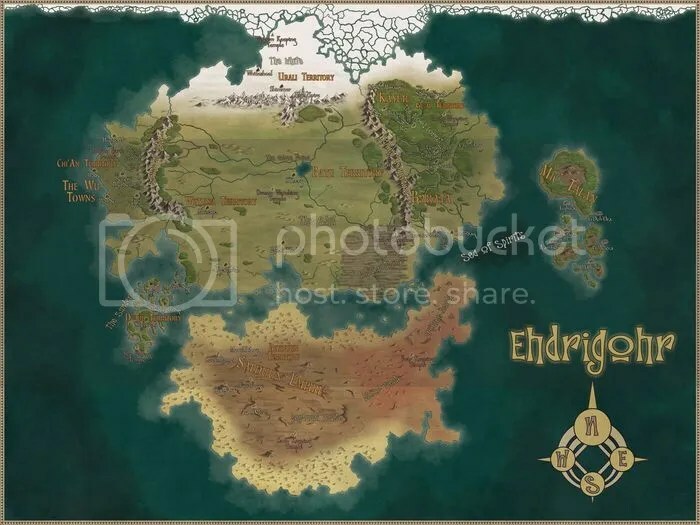 I think the first thing like that will be an interactive map that lets you explore Ehdrigohr through myths and folktales of the people of the world. Otherwise there are other game books that explore the world and the cultures a bit more. In the meantime I’ve got a project on dynamic storytelling I’m doing with a colleague, Doris Rusch at DePaul University, that we’ll be presenting in the spring at MIT’s Sandbox Conference. There is another longer term project with a group at Ohio State University focusing on the Newark Earthworks and building an interactive experience, alongside an advisory board of Native people, to educate people about Native science as it relates to the Earthworks. Thanks for talking to me about this, Allen. Ehdrigohr currently has 15 hours left to run and is fully funded, but if you’re interested in fantasy games with a unique, different feel, then you should take a look.